Chatting through Playstation 3 is possible via eBuddy Mobile, which will show your full contact list screen divided more pages and a chat window. Connect to the internet and access to the browser, press the button green triangle button, select File option and enter the url address (http://m.ebuddy.com/) via the keypad that appear on the screen, after which you can select your IM network to start chatting. 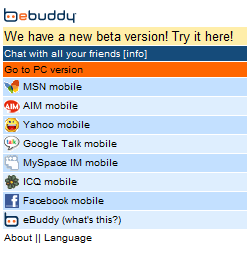 Ebuddy Mobile supports MSN, AIM, Yahoo, Gtalk, MySpace IM, ICQ and Facebook chat.